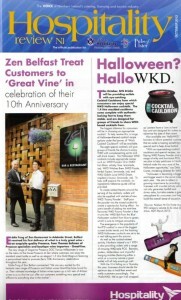 We’re delighted with the positive coverage of GreatVine in this month’s hospitality trade magazines. Licensed & Catering News covered our hugely successful Prosecco and Wine tasting event for trade customers on Monday 9th September at Zen Belfast. 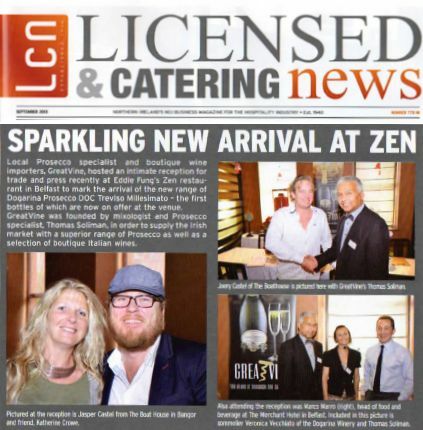 Hospitality Review also published a fantastic piece to cover the announcement of a major GreatVine order from Eddie Fung at Zen, who ordered Dogarina Gold Magnums of Prosecco with personalised labels in celebration of Zen’s 10th Anniversary. Eddie also selected GreatVine’s standard 750 ml bottles of Dogarina DOC Treviso Prosecco Extra Dry Millesimato as his house Prosecco.